Remember our board we began with last week, when we made our wood chargers? 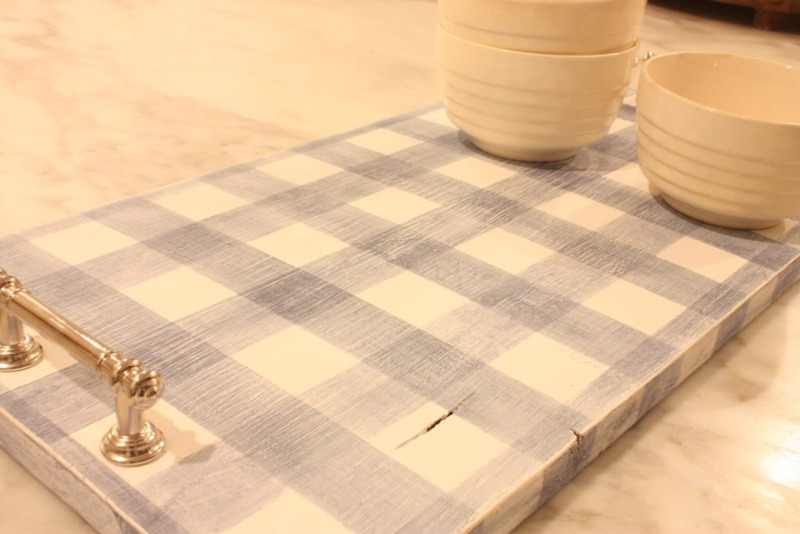 This week, this simple board was made into an adorable gingham tray with the help of Bungalow 47™ Furniture Paint! 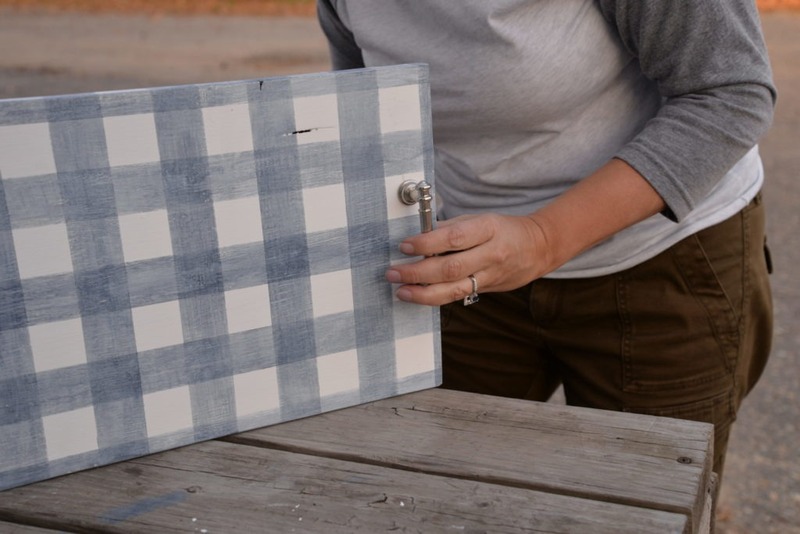 This project began by base-coating both sides of the board with our bright white, Bungalow 47™ Furniture Paint’s Farmhouse Sink. 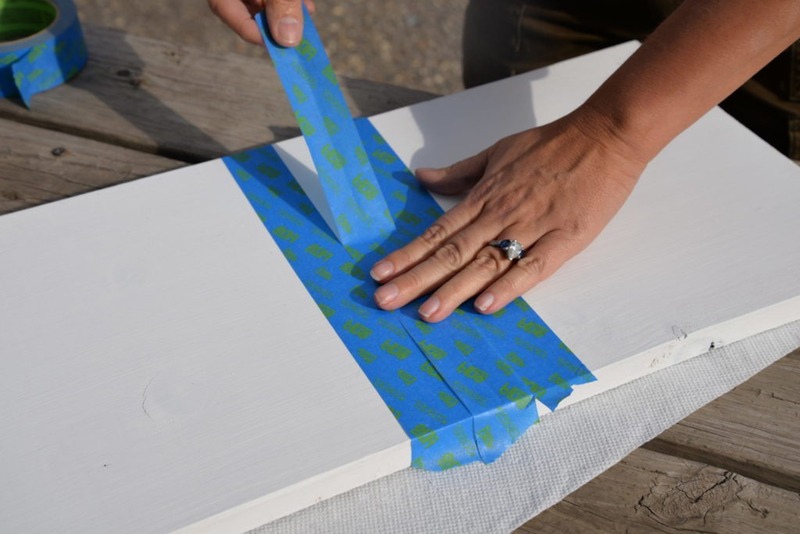 We get excited when we are doing projects (as I’m sure you do, too), but make sure you allow your paint to dry thoroughly before this next step since it involves painter’s tape! We used a tape that was 1-3/8″ wide. 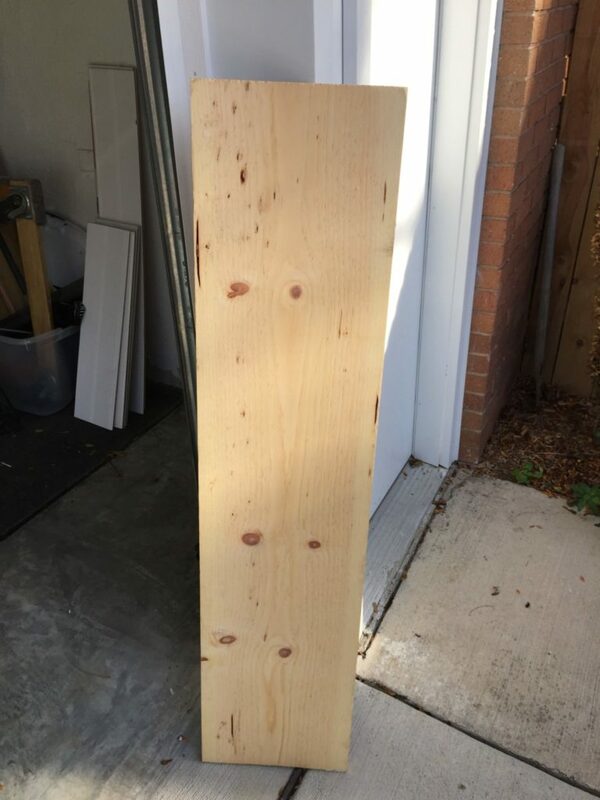 Whichever size you decide to use, mark the center of your board at both ends. This will establish the center of the plaid design so you end up in even amounts on either side. 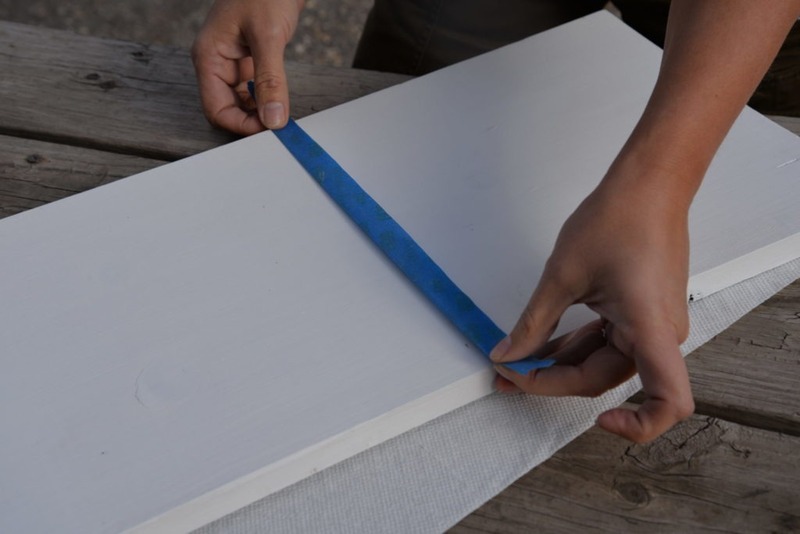 Tear a piece of tape long enough to cover your length and wrap the edges, because you’ll be painting the pattern down the sides as well. This piece will serve as your guide. Fold it in in half the long way, with the adhesive on the outside. This will help you center your pattern, and you will repeat this in the other direction as well. 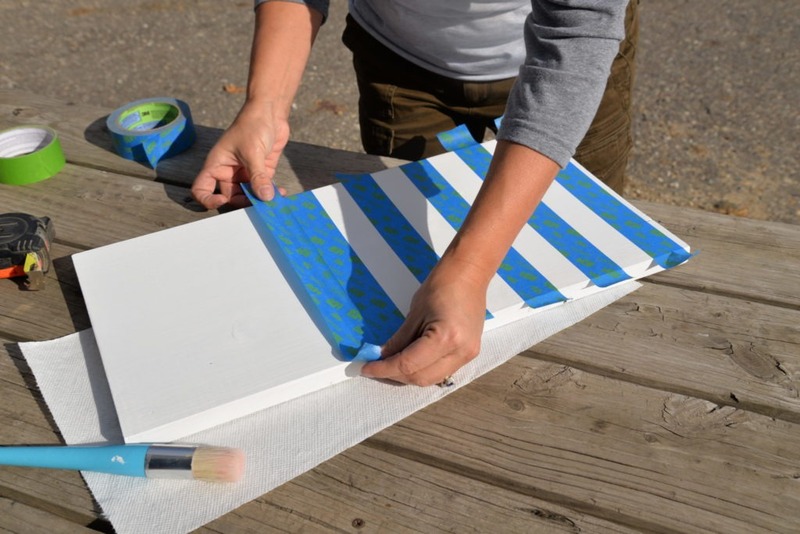 Place your center tape guide with the folded side against your center markings. 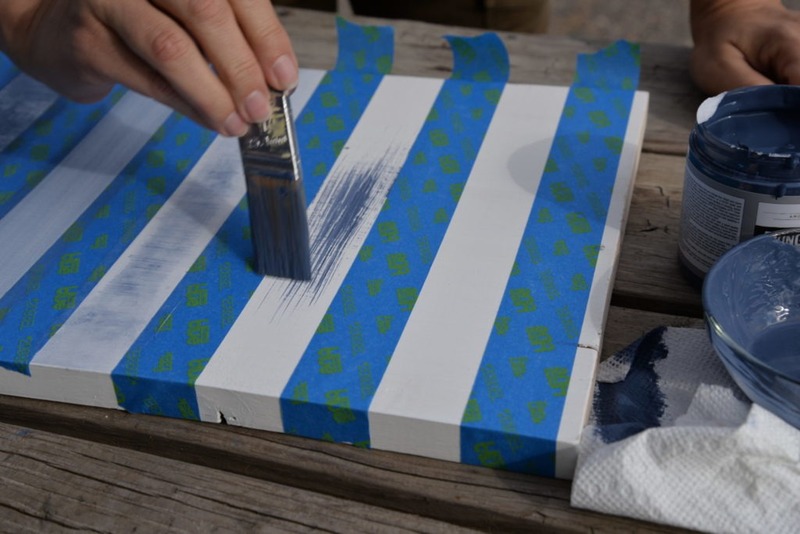 Unfold the tape: this is your guide to start your pattern. 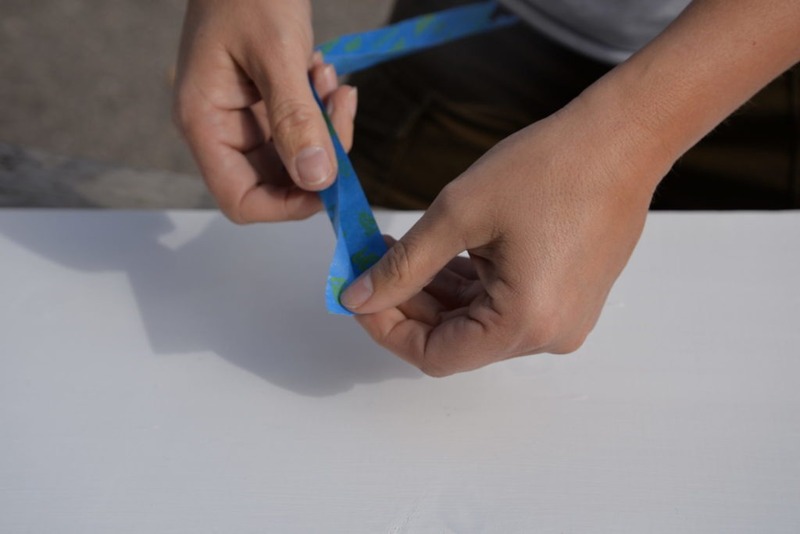 Begin butting your next tape pieces on either side of your guide, then pull away your guide, and replace it on the opposite side of your tape. 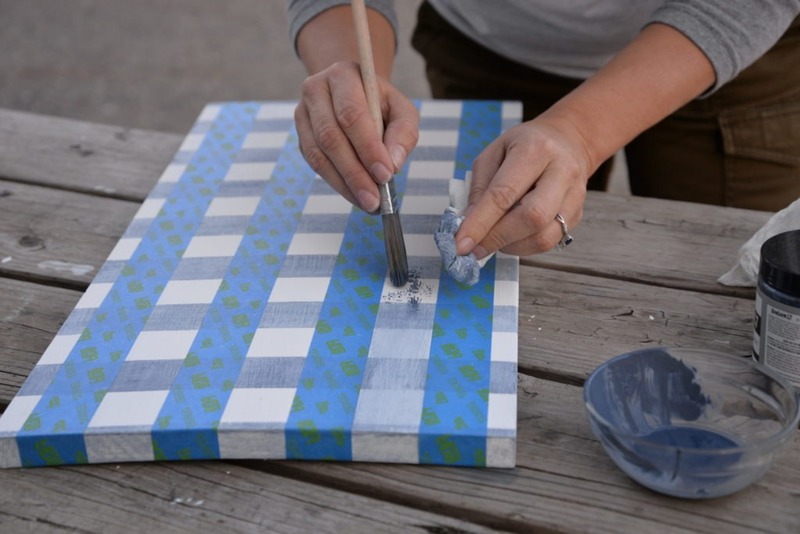 Continue doing this, moving your guide as you go until you have done the whole piece in one direction. Then, finish down the other side. 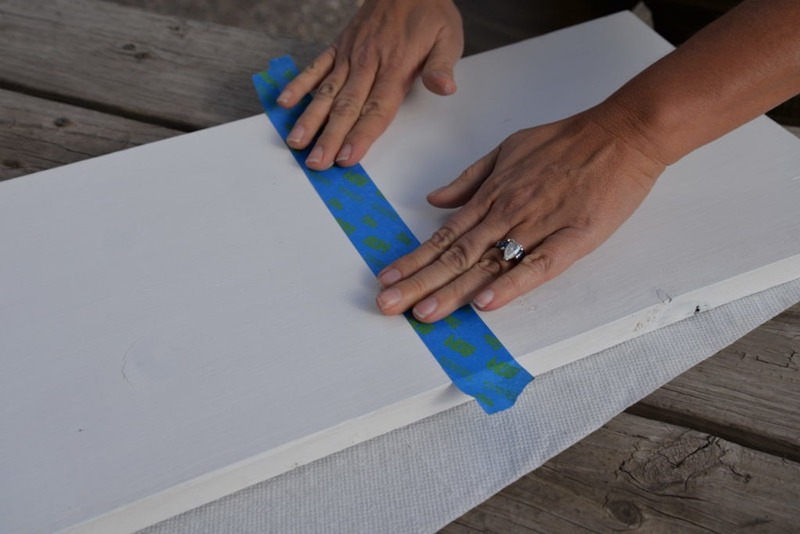 Burnish your edges nice and tight using your thumb to run the full length of the board and the edges. The white space left is where you will be dry-brushing on your accent color. We used our navy (Nautical Stripe), but we are also itching to try Front Door Red! 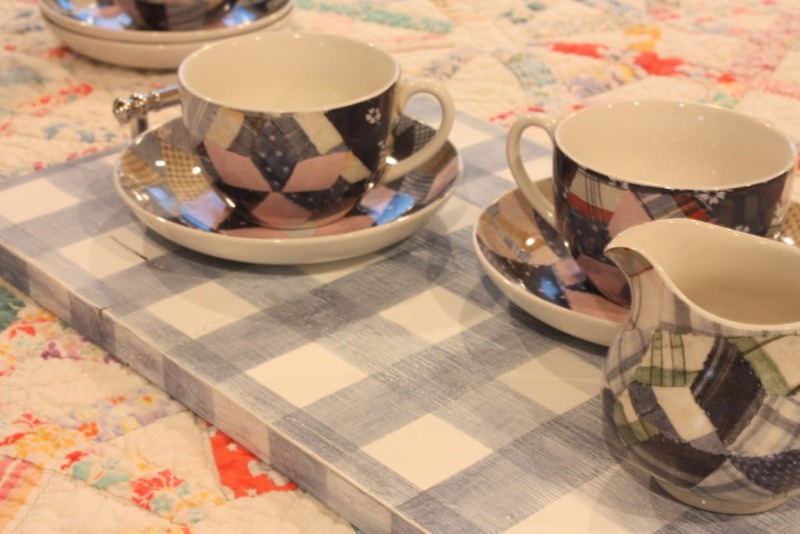 Red gingham would be especially cute for a Christmas craft! 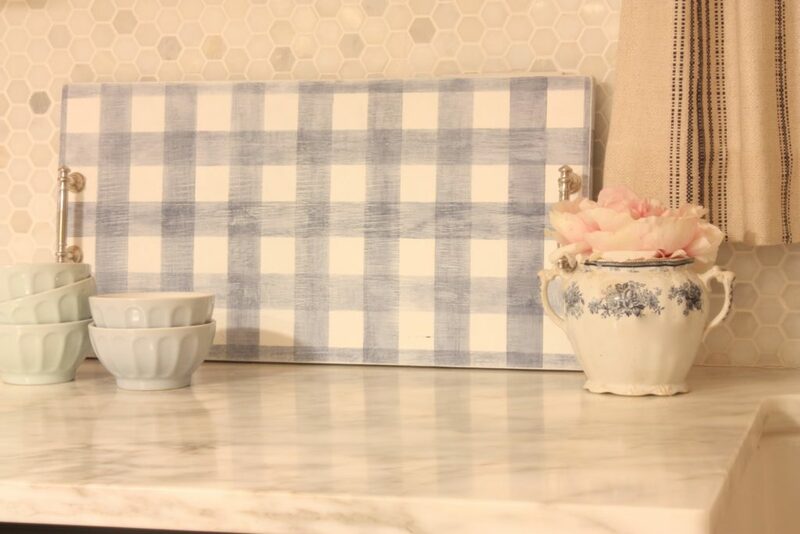 Once you have completed one whole side, do the measuring and taping process going the opposite direction, and begin dry-brushing your gingham design. You can see, when crossing over the lines going the opposite direction, that block will darken as it now has two coats of dry-brushing. 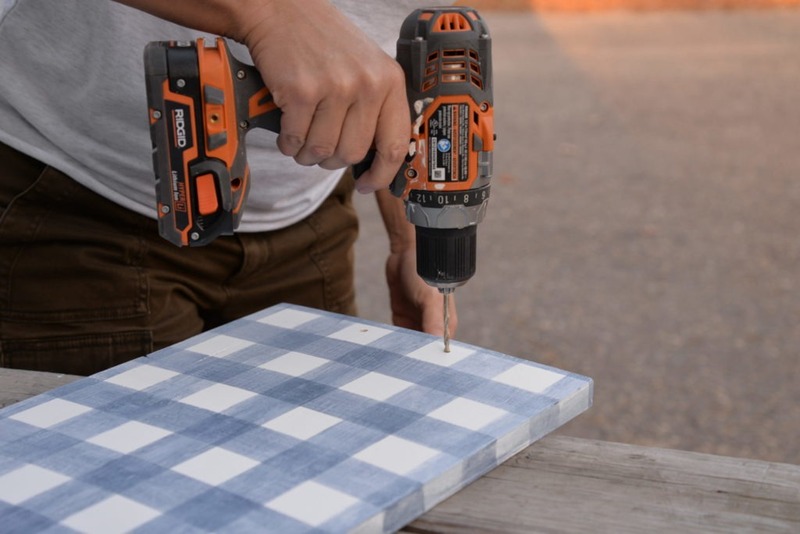 When dry, pull the tape off and drill holes for your hardware! 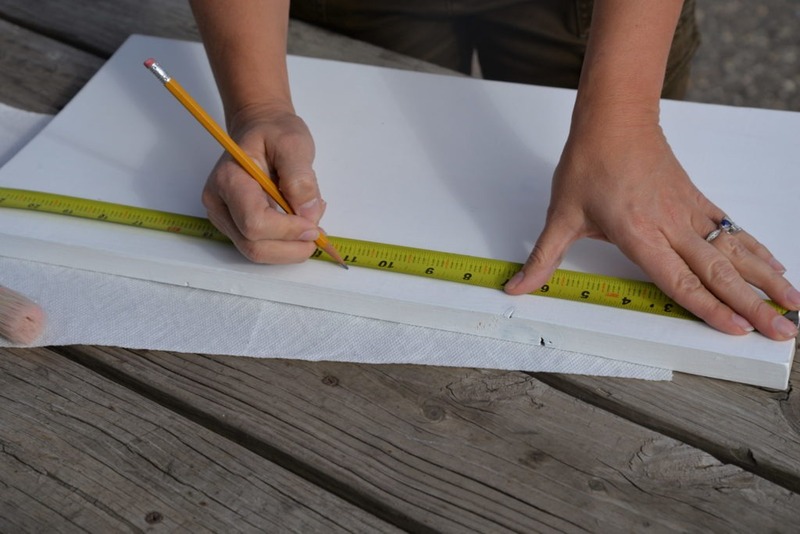 Make sure to make all necessary measurements to place in the center and fit the span of the handle design. Attach the hardware. 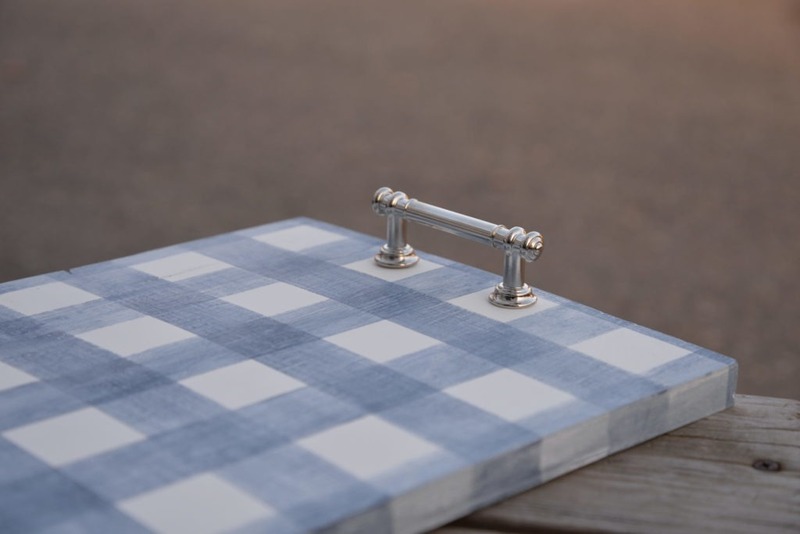 Using this type of hardware creates a totally different look than the front screw hardware we used on last week’s wood chargers. Isn’t this cute? 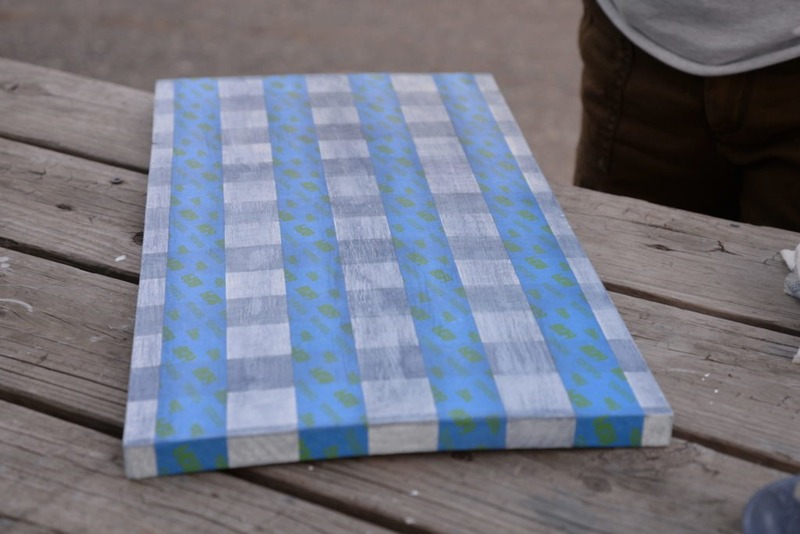 This would also be super adorable done on drawer fronts on a dresser or on a table top. 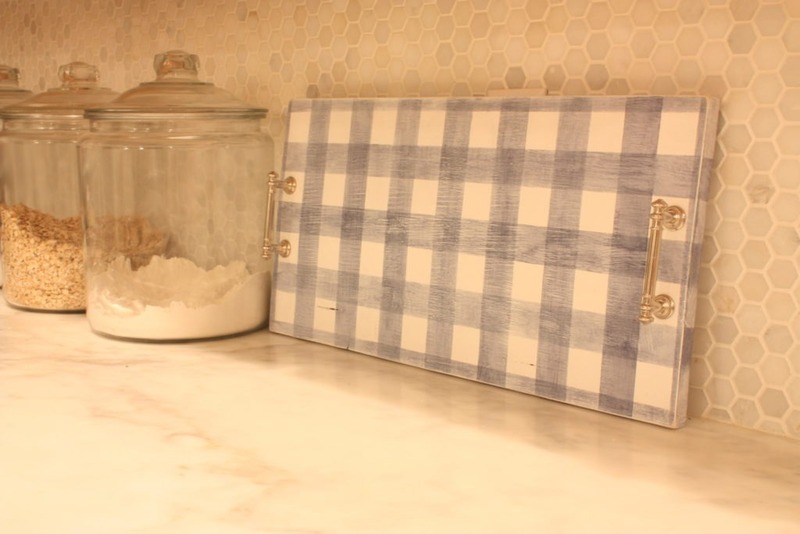 I’m not sure what’s more fun—doing the project, or finding fun ways to use the tray? 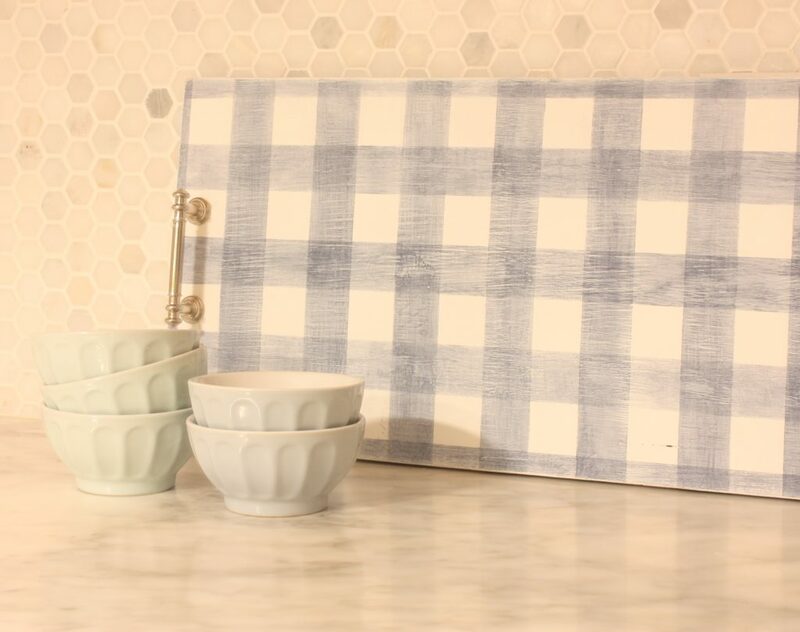 Gingham is the perfect accent for these patchwork dishes. 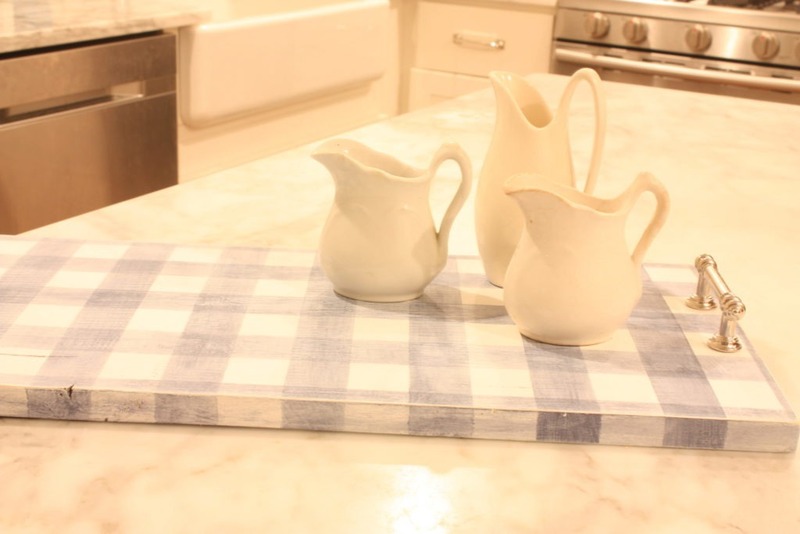 When it’s waiting to be used, it adds decor just sitting on a kitchen counter. 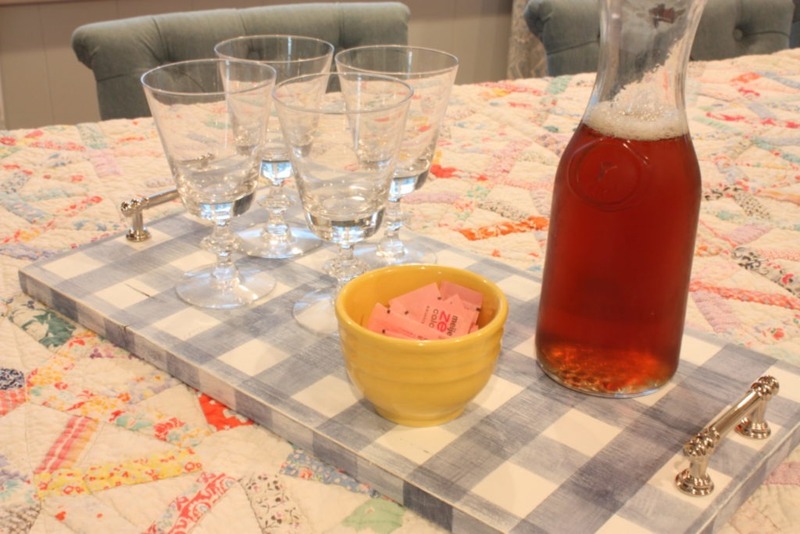 Wouldn’t this make a great hostess gift for the holidays? 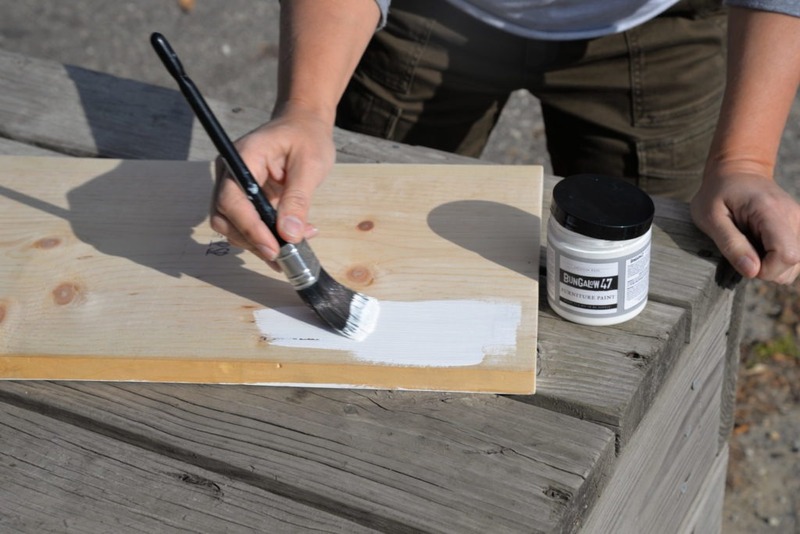 With a single board and the help of Bungalow 47™ Furniture Paint, you can have this done in no time! 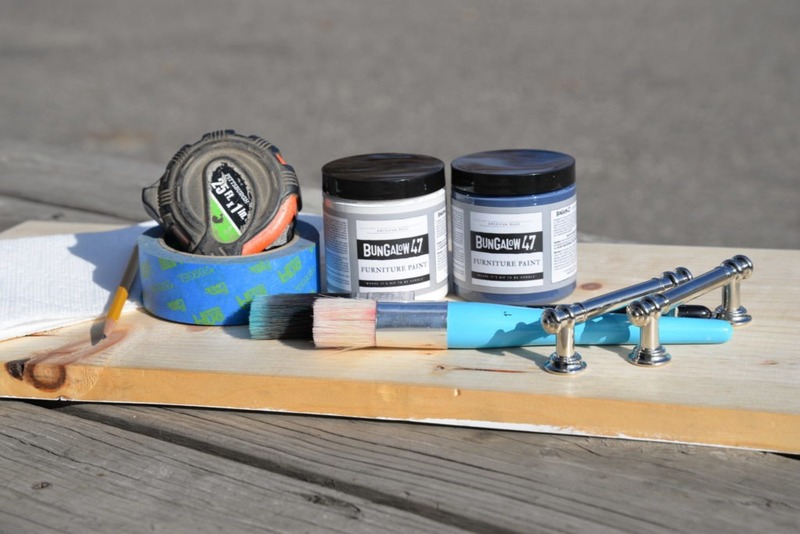 Stay tuned for more ideas using Bungalow 47 Furniture Paint.